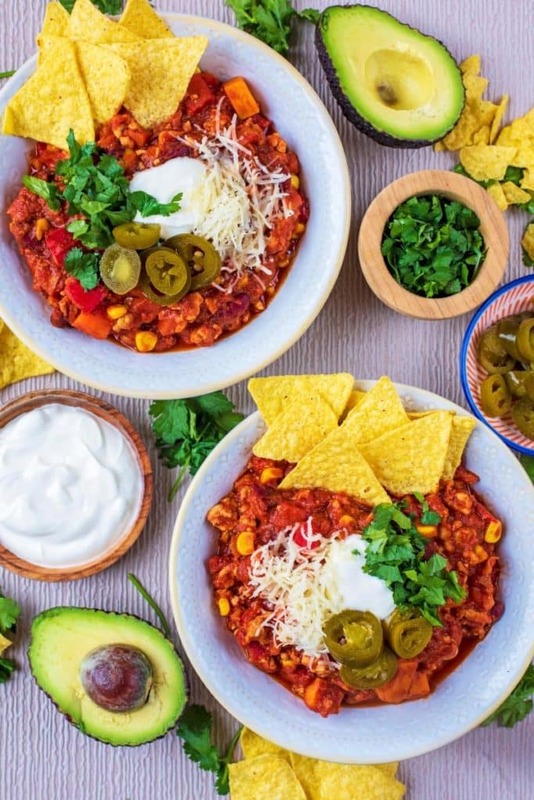 This rich and healthy Turkey Chili is made with lean turkey mince and is an easy and comforting meal with minimal effort. It is very quick to prepare and you can throw everything into the pan and let it cook away. It is all done in one pot, which means less washing up and it’s a good way to use up what you have in the fridge too. You can even cook it in the slow cooker. This thick and rich chili is made using turkey mince as it is lower in fat than most meats and still has all that comforting flavour of a chili. A delicious smokey and spicy (can be made mild) tomato sauce that is packed with beans and vegetables and served up in a big bowl. Top with crunchy tortilla chips, cheese and sour cream and you have yourself a hug in a bowl. You can make this chili as mild or as spicy as you like and it’s super easy to adapt too. Don’t like beans? Leave them out! Want to make a vegetarian version? Use tofu, extra beans or a vegetarian mince alternative. You could even make this with beef or chicken mince. This is total comfort food, but still perfect to be eaten all through summer with some cooling sour cream and tortilla chips. Can You Freeze Turkey Chili? This Turkey chili recipe is the ultimate batch cook recipe that is just perfect for going in the freezer. This makes 4 portions, so feel free to double it if you want to keep lots in the freezer. Wait for it to cool and then portion it out and put in the freezer. It will keep for 2-3 months and then once fully defrosted it can either be heated up on the hob or in the microwave. What Vegetables Can You Add? This is a great recipe to make when you have a few different vegetables in your fridge that need using up. Just chop them all up and add them in. Mushrooms and courgettes (zucchinis) work well, as does aubergine (eggplant) and celery. We also sometimes add some spinach or kale in at the end for a green veggie boost. You could swap the sweet potato for chunks of butternut squash instead. What To Serve it With? Because this recipe has sweet potato in it, we just serve it up in a bowl topped with some tortilla chips, sour cream and a little cheese. However, if you wanted a more filling meal, you could serve it on rice, quinoa or a baked potato. Any leftovers of this make a really good nacho topping. Can You Make it in a Slow Cooker? Yes, this recipe can easily be adapted to be made in the slow cooker. Simply follow all the steps until the tomatoes go in, and put it all the in the slow cooker and then cook on high for 3 hours or low for 6 hours. Two: Heat the oil in a large pan and add the vegetables. Cook for 5 minutes. Three: Add the turkey mince, breaking it up as it cooks. Cook until all the mince has browned. 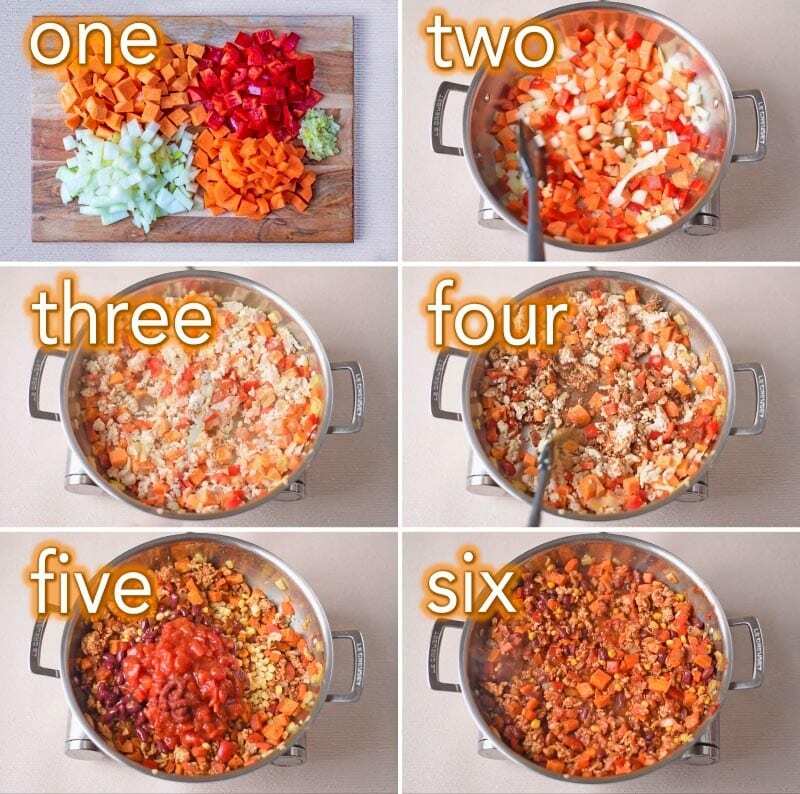 Four: Add all the spices and mix. Five: Add the chopped tomatoes, sweetcorn, kidney beans, tomato puree and chipotle paste. Stir until all mixed. Six: Add the stock and simmer for 15 minutes. Seven: Serve with tortilla chips, sour cream, grated cheese and sliced jalapenos (all optional). You can swap the turkey mince for beef or chicken or even a vegetarian alternative. Or, use just beans. Grate a little bit of dark chocolate in, along with a sprinkle of cinnamon to really intensify the flavours. Add some extra vegetables with butternut squash, spinach or kale. You can serve this in a bowl by itself, or with rice or on a baked potato. If you wanted to prep some of this in advance, you could brown the turkey and vegetables the day before and then just dump everything in the pan when you are ready to cook it. 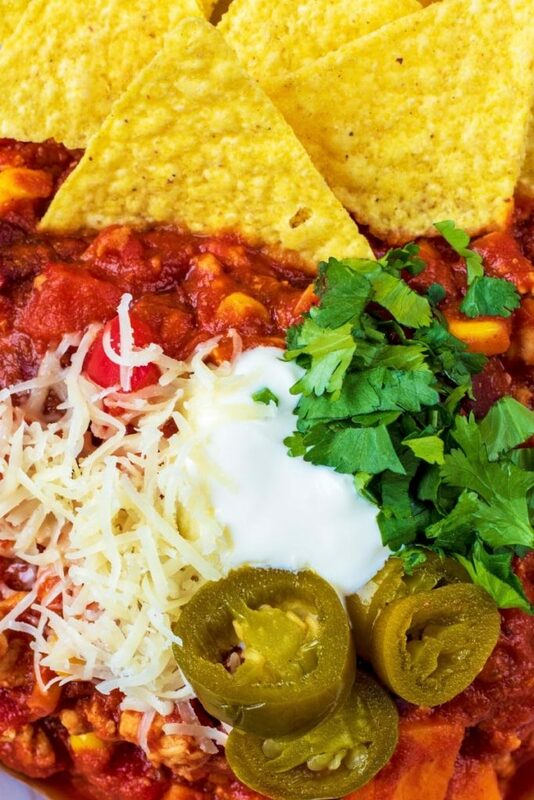 Do you want to be kept up to date on more delicious posts like this Turkey Chilli? Please subscribe to the blog mailing list (it takes 30 seconds). 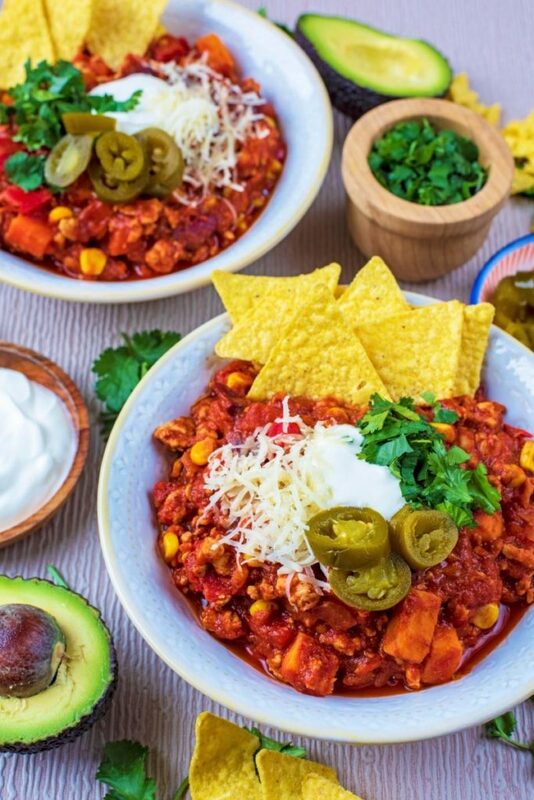 If you’ve tried this Turkey Chilli Recipe, or any other recipe on the blog, then let us know how you got on in the comments below, we love hearing from you! You can also FOLLOW US on FACEBOOK, TWITTER, INSTAGRAM and PINTEREST to see more delicious recipe ideas, behind the scenes shots and also what we are getting up to. 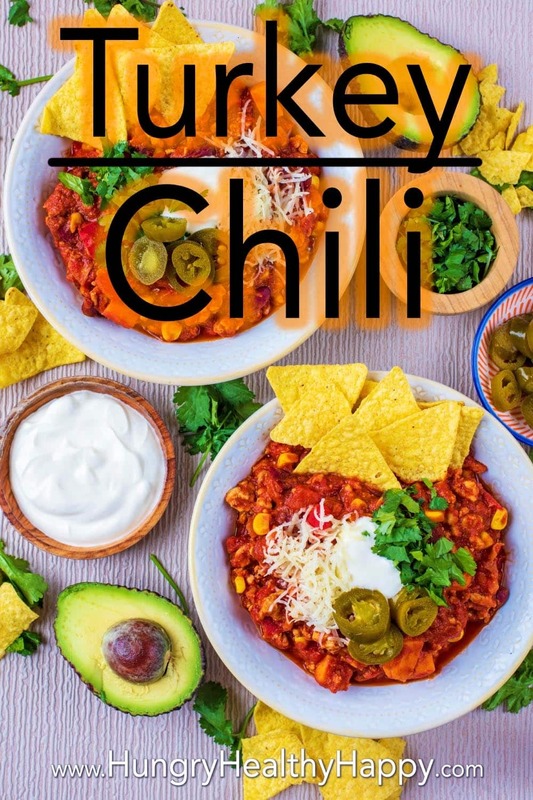 This rich and healthy Turkey Chili is made with lean turkey mince and is an easy and comforting meal with minimal effort. Heat the oil in a large pan and add the vegetables. Cook for 5 minutes. Add all the spices and mix. Add the chopped tomatoes, sweetcorn, kidney beans, tomato puree and chipotle paste. Stir until all mixed. Add the stock and simmer for 15 minutes. Serve with tortilla chips, sour cream, grated cheese and sliced jalapenos (all optional). This post was originally published on 9th November 2016 and updated on 7th April 2019. Oh this looks so good. Thank God I have seen this recipe in time for Thanksgiving! I have tried it and it tasted amazing, my guests were thrilled! A different kind of Thanksgiving meal. Happy holidays! At least you tried to let her out because it’s not good if she stayed to long in your womb. If spice didn’t work the trick, then it works for me, it’s perfect for the cold evening. Something spicy for dinner is awesome! We love cooking Turkey soup in the winter is so simple to make and cheap as well. I have never thought of using turkey as my chilli meat- but its a greta idea! My boyfriend really likes both of these things, perfect combo! Sounds like a great yummy recipe! That’s a great way to use turkey to avoid it being dry, I will need to try it as it looks really tasty and also lovely and tasty. I like quick easy meals like this. Going to try this. A lovely healthy dish and turkey is a lean healthy meat too. I really welcome such recipes. Well done!